The recent death of Tony Wilson has prompted a few mentions of the influence on him of Situationist ideas. Most famously, the name of the Hacienda club in Manchester was apparently inspired by a statement in Ivan Chtcheglov's Formulary for a New Urbanism (1953) that 'the Hacienda must be built'. The following extracts are from Howard Slater's Graveyard and Ballroom: A Factory Records Scrapbook, originally published in his excellent Break/flow magazine in 1999. It presents a more nuanced discussion of the relationship between music, commerce and radical ideas that the kneejerk dismissal of the likes of Wilson as simply 'situationist recuperators' (see for instance this recent discussion at libcom). Image is from a 1978 Factory flyer. There are many Situationist references around Factory Records that range from the obvious (Haçienda) to the tenuous (Stockholm Monsters named after Swedish youth riots of 1956?). Most would be agreed that this influence stems from Factory impresario Tony Wilson who had met short-lived SI member Christopher Grey at Oxbridge and once flashed a copy of the Situationist International Anthology during a Factory documentary, Play At Home, on Channel 4 (1984). The closeness between Tony Wilson and the long-term Factory act the Durutti Column may suggest that this group's mainstay, Vini Reilly, shared Wilson's enthusiasm: on A Factory Sample Reilly lists ex-band members in terms of 'Exclusions' and includes, as his image contribution, the Situationist Group's 'Two Cowboys' graphic. There was the sandpaper album sleeve after Debord's book Memoirs and Wilson's management alter-ego, in a reference to the French student uprisings of 1968, was called Movement of the 24th January. 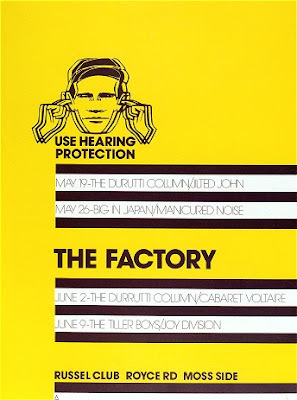 These connections between Tony Wilson and a popularisation of the Situationists was made explicit by Factory's sponsoring of the ICA's SI exhibition catalogue in 1989 and by hosting the 1996 SI conference at the Haçienda. However, most people within a post-situationist milieu would more than likely view Wilson and Factory with suspicion: he has been a long term TV presenter with Granada and a music industry mogul via Factory Records (albeit a company that went into receivership, appears to have kept minimal financial records and seemed more interested in 'sacrificing' its wealth on buildings and ostentatious interior design). To all extents and purposes Wilson occupies a position within the 'spectacle' but it should not be forgotten that Guy Debord's one-time publisher Gerald Lebovici was just as similarly involved with the entertainment industry through his activity in French cinema and publishing. Contradictions such as these are fruitful for discussion for they keep alive the issues about how best to promote and popularise revolutionary ideas: from within or from without? Can a particular social context be more conducive to these ideas than another? Is it more fruitful in the media, at the workplace, or in a club? Can music and cinema be revolutionary? What wider, transversal effects can a slight shift in cultural paradigms have? These contradictions also reveal something about the 'establishments' people are fighting against. What contents will it co-opt and why? How much is allowed through? Where does censorship begin? In sleep or at the end of an assassins rifle? It is easy to discount the likes of Wilson and Lebovici and it is made easier, even comfortable, by their being identified and dismissed as middle-class: such contradictions, capable of containing a political charge, are thus defused. For most people, seeing a copy of the SI Anthology as a subliminal flash-frame image on TV, going to a nightclub called the Haçienda or listening to a Durutti Column track is hardly a call to revolution but it is a means of keeping ideas of social change at least symbolically active and, just by thinking of advertising and the tight control capital wields over its 'self-image', we cannot deny that forms of 'symbolic warfare' are more than necessary. There is always a danger that those committed to revolutionary action forget how it was that they arrived at their position or, similarly, how that position needs to change and adapt to differing conditions and potentials. There is a cumulative effect where every little counts and in every social context. The claim that Factory, as 'pop-situationists', have watered down situationist ideas is maybe to infer that these ideas have a privileged area of application and whilst 'recuperation' is a process that can't be ignored, it too often seems to revolve around an 'individualised' response and a classification and hierarchic ordering of an action or intention. One common pro-Situ objection to the idea of music's being political is its very insertion into the 'industry', that it manufactures and sells for profit a range of consumer objects and that these consumer goods are themselves a source of mystification, sublimation and oppression. Just as this can encourage a 'transcendent' failure to engage with the political-charge of 'actually-existing' capitalism, the idea of a purchase being the alienation of some ineluctable human essence is to infer that a sold object has only one quality (its being a commodity) when, as former SI-member Asger Jorn has demonstrated, there are other qualities or values that are at play. One of these is Jorn's idea of "counter value" or "artistic value" where, instead of limiting value to exchange value and the concomitant imposition of iron-clad commodity-relations, Jorn speaks of value not "emerging from the work of art" as if it is an innate property, but being "liberated from within the spectator", from a "force which exists within the person who perceives" a painting, a movie, an installation, a record. Vaneigem Mix, incomprehensible on a first listen, stood out as both angry and rational at the same time (a kind of praxis) and what may have sounded like a spontaneous outburst soon revealed itself as needing countless listenings so as to crack its theoretical code. It is here where many people first encountered the writings of the Situationist International and it was enhanced by the added musical accent, the phrasing and unwavering conviction of the voice that drew you towards wanting to understand and learn from what was being said. It's not about recuperation or cachet. It's about just not getting it. The Collector just didn't get it and his actions proved that. He didn't get it the way Lenin didn't get it and also the way McLaren didn't get it. If you're saying that McLaren and Wilson didn't get the full implications of the Situationist critique, or at least if they did understand them they didn't follow them through, you're probably right. The Situationists were not about an avant-garde style response to capitalism, but a critique of that married to a more or less council communist notion of radical change driven by mass autonomous working class activity. This latter aspect never seems to interest the many people who now quote the SI in style magazines etc. and was hardly emphasised by Wilson and McLaren. However I think the point of Howard Slater's article is to suggest that their personal intentions and degree of 'getting it' is not the only thing that matters and that positive, possibly even unintended consequences can flow from the circulation of radical ideas and subjectivities by 'the Spectacle'. Indeed unlike English language pro-situs who have operated largely in the domain of self-publishing, Debord and co. were very keen that their works were commercially published and distributed. Did Lebovici 'get it'? He was a bigger player in 'the Spectacle' than Wilson or McLaren, who in capitalist terms have never been more than marginal subcultural entrepreneurs. So Christopher Gray met Tony Wilson at "Oxbridge"? This must be Cambridge, because Tony Wilson went to Cambridge where he was supposedly in the Kim Philby Dining Club. T J Clark went to St John's College, Cambridge. I'm interested in which universities the 4 English members of the SI (in late 1960s, after Rumney) attended. Did they all go to Oxbridge? Did they all to Cambridge?